George Graham Reviews The Little Willies' "For the Good Times"
So-called side projects by well-known musicians can range from really interesting to downright embarrassing. The fact is most creative musicians are not satisfied to be playing the same kind of music all the time, so they will often seek different avenues, especially if they happen to be with a popular band that might be type-cast stylistically. Examples from past decades include Jerry Garcia of the Grateful Dead playing in a bluegrass band, Linda Ronstadt singing Gilbert and Sullivan, Phil Collins, then of Genesis, playing jazz-rock fusion, and more recently both Sting and Peter Gabriel doing orchestral albums. This week, we have another side project, that is rather the opposite: solo performers with individual careers getting together to play in essentially a cover band. They call themselves the Little Willies, and they are out with their second album together after one five years ago. The new one is called For the Good Times. The best-known member of the group is hit vocalist Norah Jones, known for her jazz-influenced chanteuse-style of singing. But the focus of the Little Willies is country music, much of it from the early days. Though she is the daughter of Indian sitar virtuoso Ravi Shankar, and had a mother who was a big fan of classic jazz and artists like Billie Holiday and Bill Evans, Norah Jones grew up in Texas, and probably absorbed country music through osmosis. She came to look upon Willie Nelson as a big influence and mentor. While Ms Jones was still in college at the University of North Texas, she met and gave a ride to a band who were playing on campus, two of whose members were Lee Alexander, who would later wrote a couple of songs on Jones' big hit album Come Away With Me, and Richard Julian, who would become a solo singer-songwriter in his own right. Ms. Jones and Julian stayed in touch after both landed in New York where their mutual enjoyment of playing old country songs came together, They convened a band also including Alexander who played bass, guitarist Jim Campilongo, and drummer Dan Reiser. In 2003, they put together what they expected to be a one-off night of playing together at a club called the Living Room on the Lower East Side. But they found it to be a lot of fan and continued playing together whenever they were all in New York. In 2006 they released their first album together, again expecting it to be a one-off project. The members, especially Ms. Jones, went back to their musical career, but they stayed in touch, and continued to play occasional live shows, digging up material they felt was off the beaten path, but also not being able to resist playing some country classics with their own spin. According to the band's website, they started recording a second album three years ago, but it remained unfinished as the members were spread out geographically and busy their own respective careers. Then last March they decided to get together and finish the album. And the result is For the Good Times. The band said they spent more time choosing material this time. Their debut album was a collection of songs they happened to like. This time, they set out to be a bit more diverse, and to add their own stamp to the music. The material includes songs by such iconic country songwriters as Kris Kristofferson, Willie Nelson, Dolly Parton, Loretta Lynn, Lefty Frisell, and Johnny Cash. They also include one written by Quincy Jones for the movie "In the Heat of the Night," and an old song that was recorded by Gene Autry. The Little Willies are definitely a cohesive band on this CD, developing a distinctive sound that has a bit of rockabilly, a nod to early country, as well some of eclecticism. And this is a band. Despite Ms. Jones high profile, she's just one of the members, sharing vocal duties with Richard Julian, and playing what sounds like a funky upright piano. 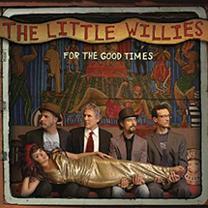 For the Good Times, the new second album by The Little Willies, a side project by Norah Hones, Lee Alexander, Richard Julian and friends, is an enjoyable, and often interesting album of mostly country music covers by a group of wide-ranging musicians who are obviously enjoying that they are doing. Though they all appreciate the old country music they draw for the songs they perform, they bring a lot of originality to their interpretations, so it does not come off as a tribute album or a even a particularly retro-sounding one, since they generally hint at the country arrangements, rather then re-creating them. And there's no steel guitar. Ms. Jones sounds great as usual though she not always the lead singer. About half the time Richard Julian's vocals are the focus. Altogether it's interesting and tasteful. Our grade for sound quality is about a B-Minus. In their mix, co-producer Lee Alexander, along with engineer Tom Shick, went for a kind of murky sound that emulated the sonic shortcomings of old analog equipment, and put a sometimes-annoying old-fashioned tape-slap style echo on the vocals. Dynamic range is also not very good either. Musical side-projects by well-known performers can range from pleasantly surprising to making their fans cringe. The Little Willies, and their country music covers, is definitely one the better ones on the scene, doing familiar songs but adding their own originality, now developing their own distinctive sound on this CD, and clearly having some fun in the process.